With the weather finally cooling down, it’s time to start thinking about those fabulous drinks, cocktail or not, that we all need to be enjoying this coming Fall season! When it gets cozy out, I LOVE myself a cup of warm apple cider! So I created this Apple Cider Mule that is OUT OF THIS WORLD delicious! It’s spicy from the ginger beer, yet warm and sweet from the HONEY CRISP APPLE CIDER (I prefer this over regular cider, it makes a world of a difference!). 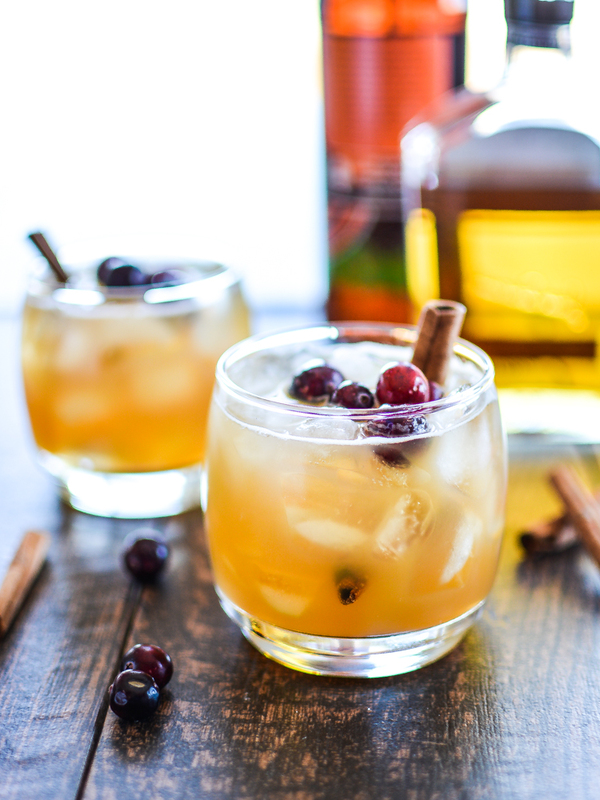 Served with some lime, freshly cut apples and some cinnamon, you cannot go wrong with the Fall inspired cocktail! Any recipe that already provides me with numbers to “feed” a crowd is an A+ in my book! This Fall-inspired punch sounds ABSOLUTELY delicious and is perfect for any family or friends gathering you may be having coming up! The way I see it, it’s a one and done type of situation! There’s nothing like cracking open a fresh pomegranate in the Fall…wait, who are kidding!? I don’t do that! I’m a hot mess and those red ruby jewels would be all over my kitchen and I’d end up with about 3 by the time I’m finished! I prefer to buy them already perfected plucked in a nice package at a VERY expensive price ready for me to partake! (That was a lot of P’s!) Whether you’re a pro at harvesting each and every aril (yes, that’s what they’re called…) or you’re like me, we can ALL enjoy this delicious pomegranate spritzer! If you’re feeling fancy, throw a splash of vodka - that’ll take off the edge of crackin’ open that pomegranate! An Old Fashioned is my favorite drink, cozy weather or not! When you find a good Old Fashioned, it’s hard not to throw back a few, so when I discovered this Fig Jam Old Fashioned I thought these were the perfect flavors to compliment the Fall season. I can tell you I will DEFINITELY be giving this baby a whirl! *For the locals: The Cracked Pepper Bistro here in Fresno serves up one of the BEST Old Fashioned cocktails I’ve had in a LONG time! YUM!!! How fresh and fragrant does this sound!? I think plums are my favorite stone fruit - especially when they’re perfectly ripe! I never thought to pair plums and thyme together, but I gotta tell ya, it sounds delightful! I think this drink would be perfect for those early days of Fall when it’s not quite cold out yet, but still a LITTLE warm out… I can feel the sunshine on my face while sipping this bubbly! Lookin’ for something on the icy side? This Pimm’s Cup sounds super refreshing and zesty - and the best part is, you get dessert at the end! I love cocktails that have fruit soaking in them, i.e. sangria, because you get all that delicious flavor in one little bite! We’re gonna take a hard left real quick away from all the apples and spices and turn towards an all-American classic, S’Mores. Since the weather will be cozy enough to get that fireplace or fire pit up and running real soon, it’ll definitely be time to start munching on those that favorite chocolately, ooey gooey treat, s’mores! I thought, while the kids are smearing chocolate all over their faces, why can’t the WE (aka the adults) enjoy a grown up version of S’mores!? I’m not a HUGE tequila fan, but I do enjoy a margarita from time to time! THIS margarita though…screams Fall and all it’s warm, luscious notes! Honey and pears go together like cream and sugar and are the perfect combination in any way, shape, or form (my personal favorite - pear + brie crostini drizzled with honey!). With that being said, why not throw them together to make the perfect Fall margarita!? Ok, let’s talk beer…pumpkin beer that is! Do you guys mix your beer and spirits together? It’s a common thing, and it’s delicious if done correctly! If you’ve never tried it and are up for the “adventurous” challenge, give this baby a go! It sounds so good, and probably something I’d throw in a sippy cup and take with me on a walk while kicking around a pile of golden leaves! Clearly I think I live in a Hallmark movie all the time, so we’re just gonna roll with it! We’re gonna end our little Fall drink journey on a nice, warm toasty one! Hot apple cider meets egg nog (the real authentic kind!) in this fabulous, rich, and cozy Fall drink. Just looking at it makes me want to curl up by the fire in a soft blanket with the pups next to me. What more could you ask for?! Now grab your pen + paper, or your phones, make your grocery lists and lets get to the store! We’ve got drinks to make!